Why I'll never be a food stylist! As the leaves start falling and the temperatures flirt with the single digits, all I want to do in the evenings is cosy up in front of the fireplace, drink hot chocolate and read a good book. Unfortunately hunger pangs rear their demanding heads once in a while, so I need to cook something substantial to eat. This is the time of the year when soups and sandwiches make their appearance regularly in the Papaya household- I love the comforting aromas of a good soup bubbling away on the stove and the sandwiches are to feed the heartier appetites. This weekend I kick-started our new winter menu with the soup-sandwich combination above. 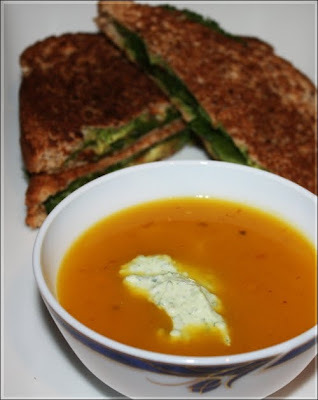 It's a simple pumpkin-potato soup with a parsley pesto thick yogurt (or dahi butter) garnish and the sandwiches are parsley pesto, avocado, tomato & lettuce paninis. The yogurt adds a tanginess and creaminess to the soup while the pesto added a hint of freshness- we thought the flavors blended well together. The picture isnt quite what I wanted it to be, I wanted 3 distinct colors in the soup. The pumpkin orange, with the green pesto drizzled on top and pristine white yogurt in the center. Of course, the pesto didnt drizzle well and after a couple of tries I gave up and mixed it with the yogurt. Then the yogurt wouldnt arrange itself the way I wanted it to, and of course it wouldnt float. 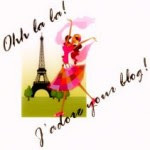 I have a new appreciation for food stylists and for the patience and talent of people with food blogs. If you want to make paninis at home and dont have a panini press try this simple trick I picked up from Rachel Ray on the Food Network. Place your sandwich in a fry pan/ grill and then use something heavy to press it. I like to use a saucepan filled with water. Presto paninis!! Clean up is a breeze too. For the pesto: Process parsley leaves, garlic, lemon juice, salt, pepper, almonds, grated parmesan cheese in a food processor adding olive oil until it all combines together. Stieg Larsson's posthumously published debut novel is the first in a series of 3 novels in the Millennium series. The Girl with the Dragon Tattoo has been popping up on bestseller lists for a long time now, which is when it went on my TBR list. The start of the book introduces the mystery of Harriet Vanger, the scion of the Vanger family who disappeared over 40 years ago. Henrik Vanger, her uncle wants to get to the bottom of her disappearance once and for all. To do this he hires Mikael Blomkvist, an investigative journalist. Blomkvist has been convicted of libel for a story he wrote about financial genius Hans Wennerstrom. Due to the conviction he has to serve a prison sentence and give up his position as publisher of Millennium magazine. Blomkvist is heading towards depression because he believes in his exposé of Wennerstrom, but has no proof. Vanger approaches Blomkvist dangling a tasty carrot- in return for his investigating Harriet's disappearance, Vanger will give him proof of Wennerstrom's financial fraud. This gives Blomkvist the impetus to agree to solve what he describes as a 'classic closed door mystery', the vanishing taking place during a family reunion on Hedeby island. Blomkvist hires Lisbeth Salander, a brilliant PI to help him, but as their investigation proceeds it quickly becomes apparent that the truth is much darker and more sinister than anyone had imagined. In addition to being a mystery, this book is also a broad perspective of Sweden, on the financial journalism, on it's social and welfare programs, on the sexual abuse of women in Sweden (presented as little tid-bits before the start of the various sections in the novel) and a family saga. It also contains technological mumbo-jumbo for a complete package of crime in the twenty-first century. In short, it's one of the most engrossing, multi-layered thrillers I've read in a long time. And it was very interesting to read about another setting, most thrillers I read seem to be located in America. Easily the best part about this book is in the unique title character of Lisbeth Salander. She's brilliant at computers, but is mostly unemotional and uninvolved in her interactions with people. That this genius comes packaged in a tiny, anorexic-looking punk facade with tattoos and piercings confuses everyone she comes across. Blomkvist is much less complicated. A possible foil for a lot of the women hating in the novel, he is a man who easily loves and is loved by women (this part really made me scoff). Blomkvist becomes the only person who does not expect or demand something from Salander, eventually they come to trust each other laying the groundwork of a formidable team. I must mention that I think the title of the translated version is misleading, Blomkvist features more in the book though I agree that Salander is the more interesting character. The book's original title in Sweden was 'Men who hate Women'. And the buzz is that the recently released The Girl Who Played with Fire deals with Salander's back story and has Blomkvist and Salander team up again. Cannot wait to read it!! Kauai, in the second week of October, turned out to be a spur of the moment trip due to an airline fare sale coupled with B's colleague regaling him with stories about hiking and camping on Hawaii's oldest island. We wanted to spend 2 days on the dramatic Na Pali coastline hiking the Kalalau trail which is rated as one of the most difficult backpacking trails in America, and camp overnight on Kauai's beaches. The first indication that something was about to go wrong was on the evening before we left when I spent a couple of hours researching our trip. Apparently, to camp at Kalalau, you need a permit and it was recommended that people apply for the permit 6 months in advance. At that point there was not much we could have done so we decided to trust in luck. So, the morning after we landed in Kauai, bright-eyed and full of hope we headed to the state department and were told there were no permits for camping until mid-October, but we could get a free day hike permit to Hanakoa. The Kalalau trail is divided into 3 segments - 2 miles from start at Ke'e Beach to Hanakapi'ai Beach, 4 miles next to Hanakoa Valley and then 5 miles to Kalalau Valley. The initial 2 mile segment can be hiked by all, but you need a day hike permit to Hanakoa and a camping permit for Kalalau Beach since it is not recommended to do the full hike (round-trip 22 miles) in a single day. Severely disappointed we decided to do the Hanakoa hike atleast. Heading to the county department for camping permits we hit another snag. Apparently the Hae'na Beach Park which is a couple miles from Ke'e Beach was closed for undisclosed reasons. This was where we planned to setup camp, deposit our stuff, then walk to the trailhead at Ke'e Beach (since the trailhead is notorious for car break-ins). We settled for camping at the nearby Anini Beach Park, since we were not doing the overnight hike we werent worried about our stuff anymore. We managed to score a campsite right by the beach at Anini (a gorgeous beach with a calm lagoon edged by a coral breaker and white sand, just dont get here on the weekend), the thrill of which was somewhat marred by families with screaming children (I am tolerant of kids but not when their parents allow them to run around yelling at the top of their lungs in an extremely crowded campsite at 10 in the night) and drunken idiots who insisted on loud talking and playing their boom-boxes well beyond midnight. A special shout-out goes to the other fidiot who imitated a rooster call, very realistically, at 4am. Way to endear yourself to people, folks! Waking up to a view of the sunrise over a gently rolling Pacific did away with all the illwill of a sleepless night for about a couple of minutes until we went to the washrooms and found that more fidiots had messed up the washrooms, re-routed water from the drinking water fountain (we saw someone taking a shower with this water supply later in the day, while the rest of us went waterless) and B cut his finger when trying to turn off the tap to the secondary outlet. At this point à la Eric Cartman we decided 'Screw this sh1t, we're checking into a hotel' and spent the morning driving around to see if there were restrooms available. The original plan was to start our hike (round trip 12 miles) at 7 in the morning. Because of all the snafus we didnt get to the trail until 830 am. We could have avoided the restroom hunting, Ke'e beach did have some decent washrooms supplied with water, no soap though, and I didnt see any place for drinking water. Anyway, by the time we reached the trailhead it was raining cats, dogs and bonobos (keep in mind Kauai is tied with Cherrapunji, India -or Mawsyngram now- as the wettest place on earth). We were going to wait the rain out, but when we got there the parking lot was full so we decided to start hiking too. The Kalalau trail was created back in the 1800s for horses and goats and the high rate of erosion on these cliffs has ensured that the trail hasnt been maintained. Consequently it's an uneven, rocky, muddy, slippery, narrow trail with portions having the rain forest on one side and straight drops hundreds of feet into the ocean on the other. The first two miles are the easiest though. The first half mile is an uphill climb with beautiful views over Ke'e beach. Also, the trail is edged by the most fascinating flora- saturated with flowers, loads of exotic fruits, berries and forests of sweet-smelling guava trees. The guavas were so ripe they had fallen off and gotten trampled underfoot with the result that the trail smelled of a heady mix of wet soil and fruity guavas. We picked a handful of guavas for a snack for when we reached the beach. After the first three-quarters of a mile or so we finally held our breath at a mist-covered ethereal glimpse of the famed coastline. All this time the trail was rocky but now it became muddy and at this point, it started raining very hard and we were soon encrusted. My shoes were ruined in a couple of minutes; I must mention that this trail needs a hardy pair of hiking shoes. B and I were prepared even with hiking poles which were a great help, but we were flabbergasted by flip-flops and Crocs on the trail. One adventurous couple were barefoot, something I would have thought twice about with the leptospirosis danger due to feral goat and rat urine in the streams. Everyone seemed in good spirits though. The last leg just before we got to Hanakapi'ai Beach, and after a dire warning of the number of people who had died on a notchable sign (the count was at 84 when we went, the pic alongside is from Wikipedia, wonder when it was taken :( ), we had to cross a fast-moving river to finally get to the beach. B managed to get across without problems, me the shorty sank hip deep. It ultimately took us 2 hours to get to the beach, with a couple of breaks in between. Because of all the warning signs about the strong currents we decided to avoid getting into the water and just continue to Hanakoa without much delay. After Hanakapi'ai, the trail immediately becomes an extremely narrow path through shrubs and trees (where little bitty mosquitoes hide out waiting to bite unsuspecting bare legs) and there are a series of switchbacks into various valleys with gorgeous views. About half an hour of this, I slipped at the very edge trying to avoid sinking ankle deep into muddy water (foolish me, there was no earthly way I could have got dirtier) and was only prevented from falling off the trail by doing a series of comical hand rolls forward and backward by which time B grabbed me. After this, I turned B's ears blue with a steady stream of invectives (it's my coping mechanism when I'm scared or angry :( ) for about 15 more minutes, when B asked if I wanted to turn back. I put up a token resistance but then agreed. As we returned it seemed that we were walking a completely new trail- 3 hours into the hike and it had been raining continuously and heavily. In most places, the trail was completely obscured by water, the little muddy water trickles were now fast-moving streams (see pic alongside) and impromptu waterfalls had sprung up which we had to wade through. The rain let up for some time letting B experiment with different camera angles and exposures, so finally we got back to the trailhead a good 6 hours after we started- completely bedraggled and muddy. We headed back to our hotel for a long, hot soak in the bathtub thanking our stars that the camping idea had been scrapped. Even though this hike was tough, I totally enjoyed it and would definitely do it again. The only disappointment for both of us was that we didnt make it to any of our milestones. The great advantage with the rainy weather was no sunburn and we didnt get thirsty at all, we carried 2l of water per person and ended up using only about half a liter for the entire hike. We even gave away some of our water to people who had run out just to lighten the load on the way back. I love pumpkins and come October I look forward to using pumpkin in everything - soups, subjis, cookies. I have a limited repertoire though, so I'm always looking for new stuff and I was excited this weekend when i came across a recipe for pumpkin with pasta, something I'd never tried before. 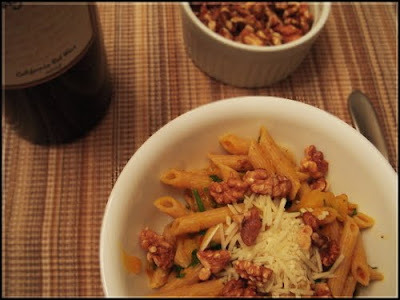 Below is a pic, the recipe I used was Mario Batali's Ziti alla Zucca (Ziti with pumpkin). If you're reeling at the combination, do try it, it's delicious!! I added some walnuts because I like to have some crunch in my pasta. The only version I HATE is pumpkin pie so this year I'm going to play around with recipes until I come up with an acceptable version for me :) Cant wait! And of course, you will read all about it here. So, suggestions- any favorite or unusual pumpkin (I mean the red pumpkin here) recipes I should be trying out? I came across this movie Before the Rains while randomly browsing today. Santosh Sivan, Nandita Das, Rahul Bose, Jennifer Ehle, Bruce Wayne's dad (heh, dont know his name), Kerala in the 1930s .... it looks amazing!! Anyone seen this movie? It's going to the top of my watch list ... and how come it's out on DVD already and I hadn't even heard about it hmpf! For the Austen fans I came across the writer Juliet Archer whose going to be writing a series of modern versions Austen in the 21st century. The Importance of Being Emma is already published and she's next working on a version of Persuasion. I've been on an Emma jag lately, just finished watching Clueless (lovelovelove this movie) so cannot wait to get my sticky Papaya hands on this book. There's nothing like retail therapy (even if it's from my own closet) to scare away the ennui :) Have a great weekend, folks!! Some of my most creative meals come about when I'm alone. Most of the time my diet staple is good old Maggi (esp. now that they've introduced the vegetable atta noodles, luuurve them). The day I run out of my Maggi and am too lazy to drive half an hour to the Indian grocery store are the days when my mental acuity is tested to the limit. Which one tempts you? Take for example, last night. My dinner consisted of Haldiram's aloo bhujia with 2 slices of bread. And if you haven't ever eaten sev with bread, it's crispy, it's crunchy, it's sweet and savory, what's not to like? (Spike I know I laughed at your meals but I was laughing with you all those times). As I still haven't gone to the grocery store, tonight's meal presents another problem. I've been debating throwing thinly sliced potatoes, red onions, celery and avocado in a skillet with salt and pepper and I doubt it will taste half bad. Actually the only item bothering me is the celery - I hate the stuff. The only reason it entered the house was I was looking for healthy snacks (no scoffing) and was sick of the baby carrots I normally chew on. In a flash of inspiration (and the result of watching countless shows on food network) I remembered someone mentioning celery and peanut butter is a great snack to get kids to eat their veggies. And if kids can eat it so can I, went the thinking. Well I tried it last night and if that shtuff gets kids to eat their veggies, I'm a size 0. Celery and peanut butter does NOT go together. Unlike bread and bhujia. So, now I have this great hunk of celery in the house and no idea what to do with it. Or atleast I know what to do with it (ref. the potato idea), I'm just not looking forward to eating it. Sigh. How about you? What are your favorite healthy snacks? Or your favorite quick fix lonely dinner? 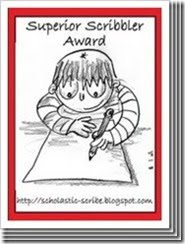 Anyways, before I continue to depress myself, let me say that the wonderfully creative avdi presented this award to me sometime ago. Her post giving away the award is inspired. Thanks a lot for thinking of me avdi!